Dual extension spring lift mechanism. Heavy duty steel lever, with special EZ-grip handle. Can be self stored or placed inside building. 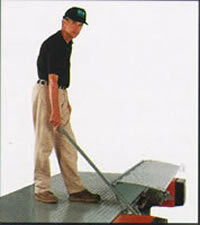 Roller-bearing lift mechanism for easy lifts. Heavy duty bumpers blocks with 4" x 12" x 13"
safety tread plate, 5500 psi (or better) minimum yield. Extended life bumpers are molded of first quality rubber. edge. Just pull back, then return to the original position. hooks as shown. Installation drawings are available. Total projection of bumper blocks and bumpers is 15". Click the Price of the item you wish to purchase. 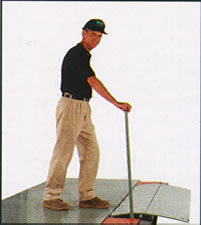 Mechanical Dock Leveler, and Neverlift from your complete source for material handling equipment.